Fire retardant paints are most frequently used in large scale industrial spaces, public buildings and facilities, or on new builds. They can also be used on smaller DIY projects, but not for those tasks that simply require heat resistant paint, like BBQs and exhaust pipes. Rawlins Paints is one of the UK's largest stockists of fire retardant paints and fireproofing coatings. Whether you’re looking to comply with safety legislation for your building (including using intumescent coatings on steel structures) or just want to make sure your home, café, restaurant, hotel, guesthouse, warehouse or office has an extra layer of fire protection, it’s important to make sure you’ve had an appropriate fire risk assessment. Once this is done, you’ll know the kind of measures you need to take, from building with specific materials, installing fire extinguishers, installing or upgrading doors to fire doors, choosing the appropriate intumescent paint to making sure you have fire retardant curtains, furnishings and fabrics inside. In complying with fire regulations, typically both the inside and the outside of the building must be fireproofed to certain standards, depending on the building’s use. For example, a restaurant or pub kitchen that is likely to be surrounded by a large amount of wooden furniture and flammable materials, will need a higher grade than a standard household kitchen. Warehouses and businesses that supply, manufacture or store lots of industrial substances will again need a different type of fire retardant paint. Warehouses, hospitals, surgeries and many other public buildings will also need an official fire escape plan, with clearly marked routes and safe meeting point. Don’t forget to include enough clear fire exit signs, as well as directions towards fire extinguishers and access to a fire blanket (particularly in industrial kitchen areas). Seek advice from a local fire risk assessment official body to give you an idea of what you need to take into consideration for fire safety. 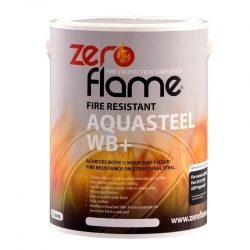 At Rawlins Paints, we have a variety of fire-retardant coatings and treatments in stock, which extend beyond walls and ceilings to timber, metal, fabric and specialist door upgrade kits. We also sell intumescent strips for fire doors, so that you can ensure your door and its surrounds are fully insulated and fire proof. All our products are issued with a certificate of conformance and we’re always happy to discuss your requirements. Contact us if you’d like to find out more about any of the fire-retardant paints, varnishes, lacquers, coatings and treatments listed on our site. Fireproof paint products include intumescent paint for steel, water based fire retardants, kits to upgrade wooden doors and much more. For buildings that need to be kept at regulation standards, for example, blocks of flats, houses that are rented out, industrial kitchens, schools, hospitals etc, fire proof paints need to be used. 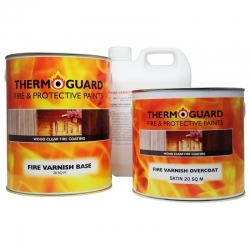 All fire-resistant paints are developed to meet certain levels of fire protection. Depending on the substrate they need to be applied to and the environment and needs of the project, fire retardant paints have distinct levels of protection. 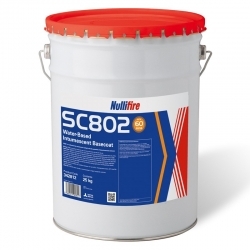 These include 30, 60, 90 and 120-minute fire resistance, which means if the wall, door, ceiling or floor has been treated properly, the extra layer applied will protect the surface for an extra 30, 60, 90 or 120 minutes. These exceed the general British Standard Class 0 and Class 1 fire rating protection. If you’re looking to upgrade your interiors, then it’s very possible to do this without an approved applicator. We have easy to use, water-based fireproof paints for wood that you can simply apply yourself. These include kits to upgrade your doors, all with full instructions, white undercoat paint and primer. You can then use your own choice of topcoat to make sure you end up with a finish that suits your space, and doesn’t compromise on quality or fire protection. Airless sprayers are often used by professional painters and decorators, but you don’t have to be a professional to use a paint sprayer to apply fire resistant paint. Many of our paints can be applied in this way and spray painting fire resistant paint has the added advantage of covering large surfaces much faster. It’s often not appropriate if you are looking to upgrade a relatively small area, so it’s probably best to stick to a roller or brush in those circumstances. 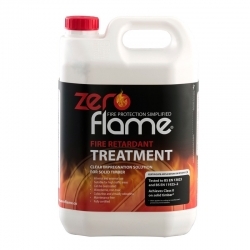 Bollom produce the Flamebar range of products which are fluids that can be applied to a range of materials and fabrics using a handy trigger spray. For larger areas they can also be applied using garden pump-up spray units taking the cost out of hiring expensive spray equipment. Spray painting is excellent for large areas that need the same level of fire protection coating, such as exterior cladding, large walls and floors, warehouse structural steels, and can be the best choice for those kinds of projects. It’s much faster and ensures an even coverage of whichever coating you choose. We have experts ready to advise you on the best method of application for your specific project, from fire retardant spray for timber to flame retardant topcoats, so get in touch if you’d like to discuss this further. If you want to keep the beautiful, natural quality of your timber then fire retardant varnish could be your best bet. 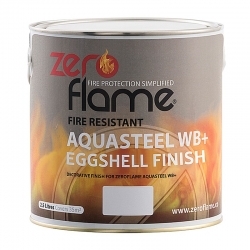 As this provides the same flame-protection standards as the fire proof timber paint, but retains a clear finish, existing varnishes, natural wood or wood stains will still show through. In fact, you won’t be able to tell that the varnish is fire resistant, so the focus can remain on the aesthetics of your surfaces. As well as protecting from the danger of fire, intumescent paints can be used to give a beautiful finish on steelwork. There are different finishes available, depending on the required look. A high quality waterborne intumescent paint will give you a 30 or 60-minute level of fire resistance using just a few coats. A compatible anti-corrosion primer should be used prior to applying the intumescent paint. You can use either a gloss finish, which not only looks great but is also easy to clean and very hardwearing. Alternatively, an acrylic eggshell paint can be used with an intumescent base coat, which will give you a subtler finish than a gloss, with all the fire protection you need. Finally, you could opt for a vinyl matt finish, although this isn’t as easy to clean and isn’t quite as hardwearing as the other paints. Specialist fire retardant paint brands stocked at Rawlins Paints include 3M, Bollom, International, Jotun (Steelmaster), Sika, Thermoguard and Zeroflame. If you cannot find the specific product you require, please contact us and we will be able to offer a suitable alternative, or track down your specific project needs. 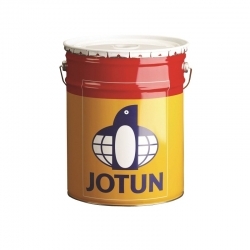 Protection for metal, timber, walls and ceilings, fabric, doors and more. Class 1, Class 0, 30, 60, 90 and 120-minute protection. Wide range of topcoats to allow our systems to be finished in virtually any colour. All our products meet British Standard requirements and are issued with a certificate of conformance (our products now also conform to most European standards too). Fire protection doesn’t have to be hard work, let our technical staff help you get the level of protection you require and the finish you want. Whether it’s structural steel in a warehouse, fire retardant paint for wood on a new-build, or the internal walls of a block of flats, we can provide a full specification and offer guidance throughout the project.